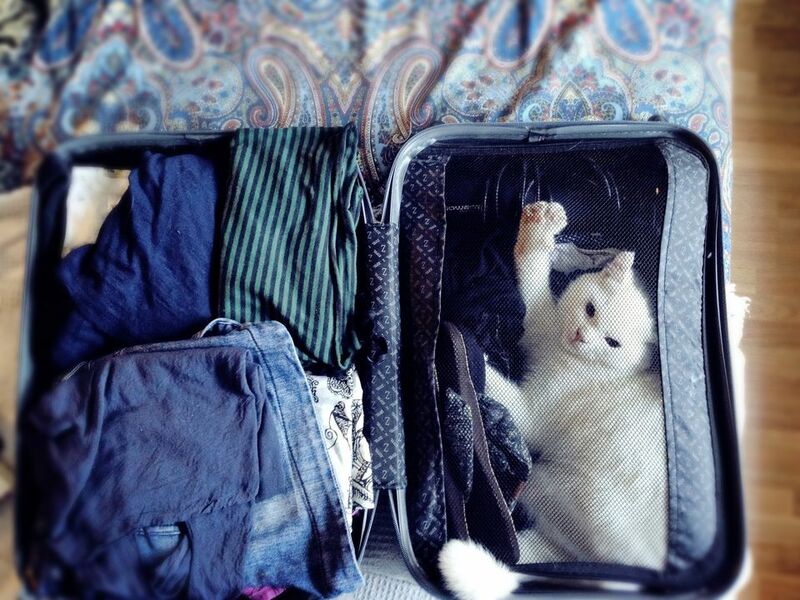 Does your cat travel or are you interested in flying with your cats? Pedigreed kitties do it all the time to reach cat shows. Here's how! Be sure to call airlines ahead of time to find out the latest pet requirements. You will need a health certificate, including proof of vaccination from your veterinarian. Small pets that fit into carriers sized to slide under the seat can travel as carry-on luggage. There is an added charge and a limit to the numbers that can be in the cabin at one time, however. It's usually a first-come, first-serve deal, so make this request early. You'll also need to prepare your kitty in advance for the trip to be sure they're comfortable for the length of the flight inside a crate. Start crate training a few weeks in advance. Be sure all your contact information is on the carrier and on the pet. It's best if the cat doesn't get upset about confinement. And don't use tranquilizers, because that can cause problems at high altitudes with slowed heart rate and respiration! Some carriers such as Southwest and Jet Blue only accept pets as a carry-on, but others will also take pets as “extra baggage” or cargo during certain times of the year. If you cannot take your cat as a carry-on, be sure to insist on "extra baggage" so that the cat is in the pressurized temperature controlled part of the plane. Different airlines have different policies, and the American Kennel Club has some links to great travel tips and basics from different carriers. Continental has a special program called QuickPak for same day airport-to-airport cargo transport designed for pets—but remember, "cargo" means in the belly of the plane. Travelers can also “earn miles” with their PetPass program, a frequent flier program for animals. Pet Air specializes in pet transport, also in the belly of the plane. Jet Blue allows pets to earn frequent flier points as well. For each leg of the trip, pets will earn two True Blue points each way—the same their human counterpart would earn for a short trip. The airline gives one free round-trip flight for every 100 points earned for those signed up for its free True Blue program. The airline allows a max of four pets per flight. The furry traveler must weigh 20 pounds or less with its carrier. Pet Airways offers air travel specifically for pets (not people) but only flies to certain destinations. Check for airline pet travel information to find the latest requirements and options for your pet travels using commercial carriers. Airlines change policies frequently so the special programs may no longer be in effect or new ones may have been created.